The first few months with your newborn can be chaotic and overwhelming for first-time parents. Caring for a newborn is tough and challenging, but it is also one of the most wonderful experiences of your life. 1. Feeding & Burping: It is very important to feed the baby on time. A newborn has to be fed every 2 to 3 hours, which means you need to nurse him/her 8-12 times in 24 hours. An infant should be fed only breast milk for the first 6 months of life. Breast milk contains vital nutrients and antibodies that are required for a baby’s survival and growth. The breast should feel less full once the baby is done the feeding. This is an indication that the baby is getting enough milk. In case breast milk is not an option,feed the baby with a doctor-recommended formula. The baby should get 60 to 90 ml of formula per feeding. Once the baby is fed, she needs to be burped. Burping expels this excess air, thus aiding indigestion and preventing spit-ups and stomach colic. Gently hold the baby against your chest with one hand. Her chin should rest on your shoulder. Pat or stroke her back very gently with your other hand until she burps. 2. How to Hold Your Newborn: It is very important to support your baby’s head & neck with a hand because the neck muscles are not yet strong enough to hold up the head independently. The back bone is also still growing and becoming stronger. The neck will be able to support the head on its own only after 3 months of age. 3. Umbilical Cord Stump Care: Do not bathe your baby for the initial 2-3 weeks. Give her a sponge bath instead with lukewarm water. Keep the navel area clean and dry. Keep the baby’s diaper folded down so that the stump can dry. Disinfect your hands before handling the navel area. To clean, use adamp cloth and dry with a clean, absorbent cloth. 4. Diapering: If your baby is getting sufficient breast milk or formula, she will wet at least 6 to 8 diapers in a day, along with regular bowel movements. Change her diaper frequently, as soon as it feels full. You may even have to change it at least 10 times a day. To change a dirty diaper, you will need a changing sheet, gentle diaper wipes, diaper rash cream or baby powder and fresh diapers. 5. Bathing: You should start bathing the baby 2 to 3 times a week after the cord stump dries and falls off. Make sure you have all the bathing and changing supplies ready before you take the baby for a bath.Bath time just before bedtime helps babies sleep more soundly. You will need an infant bathtub,lukewarm water, mild baby soap or body wash, a washcloth, soft towel, baby lotion or cream, new diaper, and fresh baby clothes. Get your partner or a family member to help, so that one person can hold the baby’s neck and head above the water while the other bathes the baby. Use soap sparingly.Rinse your baby’s body with lukewarm water. Once this is done, dry the baby’s body with a soft towel,apply lotion and put on a fresh diaper and baby clothes. 6. Massaging: Massaging helps in soothing the baby to sleep and in improving blood circulation and digestion. Spread a small quantity of baby oil or lotion on your hands. Next, gently and rhythmically stroke her body. Maintain eye contact with the baby and talk to her when massaging her body. 7. 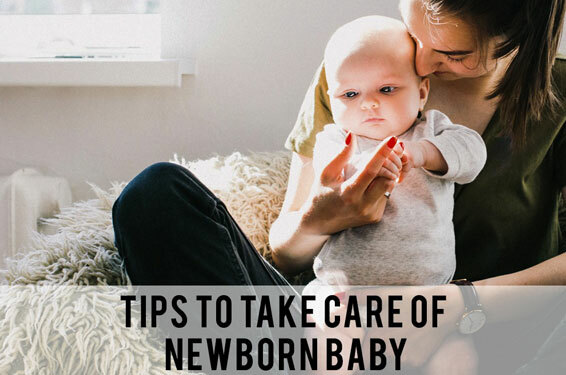 Handling Your Newborn: There are a few things to keep in mind when playing with your baby.Never shake your baby as the internal organs are delicate and can be damaged by vigorous shaking. Donot throw the baby up into the air, as this can be dangerous. Always disinfect or wash your hands before handling the baby, as their immune systems are not fully developed, and they are vulnerable to infections. Make your baby lie on her tummy every day for a short while. 8. Sleeping: Newborns need to sleep for about 16 hours a day in the first 2 months. They usually take naps that are 2 to 4 hours long and wake up if they are hungry or wet. As the baby needs to be fed every 3 hours, you may need to wake and feed . Do not worry in case she does not follow the ideal newborn sleep pattern. Every baby is different and has a different sleep cycle. A mother should try to take naps along with the baby. She can also use the time to have a bath or eat a meal peacefully while her baby is asleep. 9. Trimming Nails: The baby may scratch her own face or body with her hand movements. Hence,it is important to keep the baby’s nails trimmed. As the nails of a baby are soft, so use baby nail clippers.